For me, the most valuable gift of my long-term working relationship with Shahriar is the trust that has developed between us. 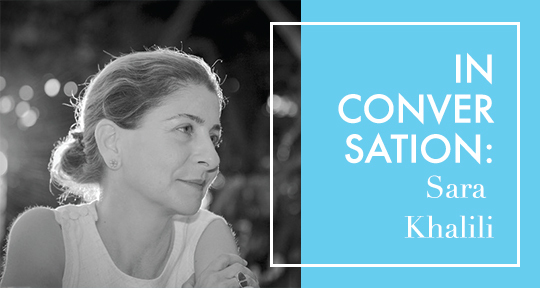 Sara Khalili is one of a handful of translators bringing contemporary Persian literature to English readers today. Her translations include works by Shahriar Mandanipour and Goli Taraghi, among others. After several years of reading her translations and communicating with her via email, I finally met her a few months ago at a PEN World Voices event in which she was interpreting for Hossein Abkenar, another Iranian author she translates. Meeting Sara was, for me, like meeting a kindred spirit; she has a calming presence and, as with many literary translators, one can feel how this is a labor of love for her. Following the publication of Moon Brow, a novel by Mandanipour that came out with Restless Books in April 2018, we conducted this interview. She speaks to us about the peculiarities of working with Mandanipour and the larger context of her work as a translator from Persian. Poupeh Missaghi (PM): Will you share with our readers the story of how you became a translator? And what has been the biggest reward for you as a translator? Sara Khalili (SK): Most literary translators will tell you that their work is a labor of love. It is the same for me. I get great satisfaction from working on literature. And being deeply proud of my heritage and culture, I find it gratifying and rewarding that in my own small way I am helping introduce the literary art of Iran to an English reading audience. By trade and training I am a financial journalist and worked in my field for many years. I only thought about translation on occasions when the late Karim Emami would tell me that I was wasting my time, that I should just quit my job and translate literature, that I had a flair for it. Karim, a dear friend and a close relative, was one of the most eminent Persian literary translators, as well as a renowned editor and literary critic. Our back and forth banter went on for several years until in 2004 he called to tell me that PEN was publishing an anthology of contemporary Iranian literature and that I should work with him on the short story he had been asked to translate. As we worked on that story, Karim guided me and educated me on the art of literary translation. I was hooked. Several weeks later, the editor of the anthology, Nahid Mozaffari, asked if I would translate a few more stories on my own. Of course, I would! By the way, among them was “Shatter the Stone Tooth” by Shahriar Mandanipour. It was the first time his work was published in English.